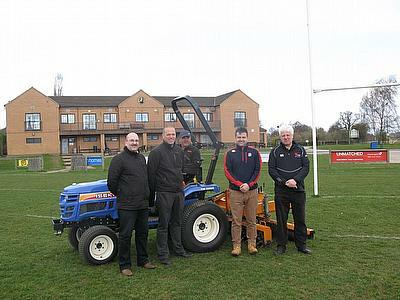 Working with trusted industry partners, Keith Kent has devised a rugby club pitch maintenance equipment package. The package is designed to meet the needs of rugby union clubs that aim to deliver a high quality pitch maintenance programme. The range of machinery includes a SISIS Quadraplay, SISIS Multitiner and Iseki TM3265 tractor. As we move towards the rugby world cup in 2015; rugby clubs throughout the country will be looking to use this opportunity as the catalyst to grow their club. In order to be ready to deliver this, the RFU is challenging them to get ‘Fit for 15’. Part of this challenge will be to ensure that clubs have the appropriate pitch quality and capacity ready for the influx of new players. Simple design with low maintenance, the SISIS Multitiner is a drum type tractor mounted aerator, which is ideal for use on sports fields and fine turf surfaces. Fast and effective to improve drainage and encourage better root growth; the aerator incorporates quick release solid tines and a working depth of up to 100mm. The SISIS Quadraplay is a versatile pitch maintenance system. Connecting to any tractor with a 3-point-linkage, the versatile one passmaintenance system includes a mounted frame with four implements. The implements can be arranged in any order and can be lifted out of use when not required. A single pass allows up to four operations to be carried out simultaneously including surface aeration, sward cleansing, rolling and brushing, which when combined together, enable groundsman to prepare and maintain a pitch to the desired standard as well as looking aesthetically pleasing.